South Korean President Moon Jae-In begins his tour of Brunei, Malaysia and Cambodia on Sunday. This will mark the first state visit by a South Korean President in nine years since the last visit in 2010. It will also be the first state visit by a leader of another country to Malaysia since Yang di-Pertuan Agong, Al-Sultan Abdullah Ri’ayatuddin Al-Mustafa Billah Shah took the oath of office at the end of January. An official Welcoming Ceremony and a state banquet will be held for President Moon, hosted by the Yang di-Pertuan Agong. He will also have a meeting with the Prime Minister Tun Dr Mahathir Mohamad and engage in wide ranging discussions on the promotion of the bilateral relations. In the 1980s, Malaysia launched the Look East Policy under Dr Mahathir’s leadership. Malaysia dispatched public officials and students to Korea in order to learn from the Korean experience of economic development. Those people have now become leaders in various areas of the country, serving as invaluable human bridges between the two countries. The Prime Minister declared that the policy would be revitalised following his return to office in 2018. And indeed the expansion of the Look East Policy was discussed with a focus on human capital development and digital technology, on the occasion of the meeting with South Korean Foreign Minister Kang Kyung-wha last December. 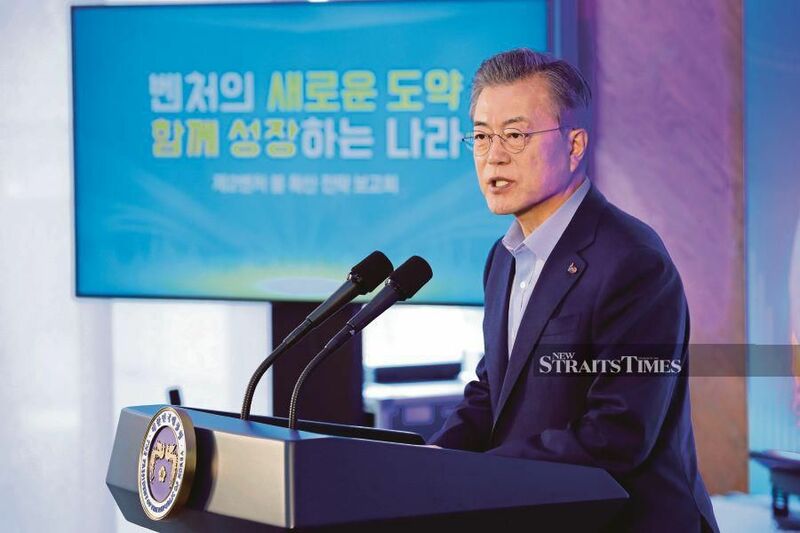 President Moon also launched in 2017 a new initiative, the New Southern Policy — this aims to elevate the relations between Korea and Asean including Malaysia, to a heightened level equivalent to the relations with the four powers of the United States, China, Japan and Russia. In this regard, under the New Southern Policy the South Korean government has implemented various forms of cooperation with Asean countries in the three pillars of People, Prosperity and Peace. South Korea has also reached an agreement with Asean on holding the 2019 Asean-ROK Commemorative Summit in Korea and this will generate even greater momentum for the New Southern Policy. I trust that the two countries’ strong will for cooperation with each other, as reflected in Malaysia’s Look East Policy and South Korea’s New Southern Policy, will come to even fuller fruition through this state visit. People-to-people exchanges increased by about 25 per cent last year. Indeed, the number of visits between our two nations reached almost 1 million in 2018. Our two nations are also expected to hold various cultural events and exchange programmes in celebration of the 60th anniversary of the establishment of diplomatic relations in 2020. This will generate renewed impetus for exchanges, deepening the bonds of friendship between our peoples. The Hallyu, or the Korean Wave, as seen in K-pop and K-dramas, is enjoying great popularity in Malaysia, and this is now generating interest among Malaysian people in Korean products. Halal restaurants are increasing in Korea. A few Malaysian restaurants that sell Malaysian food such as nasi lemak have started to open in downtown Seoul. The K-Wave & Halal Show in Malaysia will be held on March 12 and 13. This will provide an excellent opportunity for us to foster an even deeper mutual understanding. It will be a great chance to further our co-prosperity through the Korean Wave and cooperation on a Malaysia-led Halal industry. Bilateral trade volume has steadily increased, exceeding US$19 billion last year, and our two countries have a complementary and mutually beneficial trade structure. Indeed neither side experiences a large trade imbalance. Over the last decade Malaysia has indeed achieved political stability and economic development. It has well-structured infrastructure in place. It enjoys economic vitality with an annual growth rate of 5 per cent, and it has well-trained human resources of excellent calibre. Given this, the Malaysian economy is attracting the attention of Korean enterprises. In fact, it has strong potential for cooperation with Korea in the 4th Industrial Revolution and high-tech industries such as electrical and electronics, electric vehicle and bio industry. I look forward to signing of agreements in various fields between the relevant ministries and institutions of the two sides on the occasion of this state visit. Moreover, a number of companies of our respective countries will have meetings and engage in concrete discussions at the Malaysia-Korea Business Forum on March 14. Malaysia, as an Asean co-founder and one of the leading countries, plays a full role in promoting stability and peace in the region. Furthermore, it has rendered invaluable support for the peaceful resolution of the North Korean nuclear issue, for denuclearisation and taking deep root of peace on the Korean Peninsula. I look forward to Malaysia’s continued interest and support for the efforts by the South Korean Government and the international community in order to accomplish the cherished goal of bringing everlasting peace on the Korean Peninsula. With the momentum generated by President Moon's state visit and the milestone of the 60th anniversary of the establishment of diplomatic relations in 2020, I have every confidence that the bilateral ties will be enhanced greatly in a whole spectrum of fields, including the political, economic, social and cultural realms. And that this will lay solid ground for the nurturing of even deeper ties in the next 60 years.